As you may have read in the newsletter we sent you, we are preparing two distinct versions, Personal and Professional. We would like to show you the main features and compare both versions. The Personal version has been completely redesigned and improved over the current version and many new features have been added as you can see in our latest blog posts. It is suitable for users who want to have a completely creative tool, but do not need or wish to have any special features and do not use Flame Painter for commercial projects. The Professional version has got more useful features for the professional artists and the more advanced users. This includes unlimited Layers, editable Vector Layers or Supersmooth Antialiasing and can be used for commercial projects. This is all on top of what you get in the personal version. 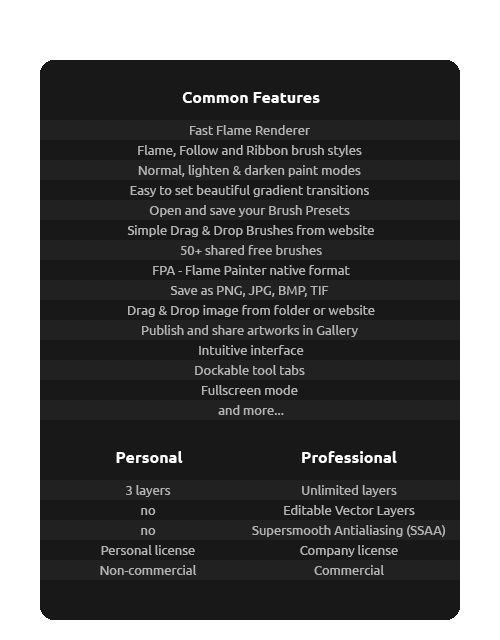 We are pleased to announce a special offer for Flame Painter 2.0 to all our 1.x users. We love to make a special deal to who supported us from the beginning. We really appreciate all of your continued support. As promised, we want to make sure that you are benefiting from being first supporters – thus we are offering you 50% discount on the Personal version. On the top of that, our offer allows you to save $30 on our new Professional version. * $9.99 - Special price for users who purchased Flame Painter 1.x in April or May 2013, who will receive extra $5 discount voucher (via email) to make sure you can get Flame Painter 2.0 without losing any value from their recent 1.x purchase. The above prices are valid until June 4th, 2 weeks after release of 2.0 version. However, we would like to continue offering you, our original Flame Painter users, a special 33% discount also after the initial 2 weeks period. We improved Flame Painter 2.0 a lot, we have made a huge step forward and are now preparing for even more features for the upcoming 2.x updates, which all will be for free. We will also release a new Flame Painter Demo soon, so you can try all new features yourself. So this is all for today, in the next session we are going to write more about layers and especially about editable vector layers.